Since eBooks are usually protected by DRM, which often restricts you from copying or sharing eBooks with your friends or even on your other devices, to remove DRM and convert eBooks to epub or other common eBook formats is necessary sometimes. It is known to us that epub is the most commonly used format for most of eBooks reading apps like Calibre. While Kobo eBooks you bought are usually in epub or PDF with Adobe DRM protection that restrains you from reading the Kobo eBook on Calibre directly. If you are wondering how to extract epub files from Kobo so as to put the eBooks in Calibre, you should convert Kobo to epub with DRM removed at first. Kobo, full-named Rakuten Kobo Inc., is a Canadian company that sells e-books, audiobooks, e-readers as well as tablet computers. It offers the most popular and trending eBooks perfect for any reading mood. Besides, Kobo app is available for so many platforms such as Android, Windows, iOS, Mac, Blackberry 10 and Windows phone smartphones. Moreover, there are several series of Kobo eReaders marketed by Kobo for book reading, including Kobo forma, Kobo Aura, Kobo Clara HD and so on. In Canada, Kobo eReaders once exceeded Amazon, Sony and other eReaders to be the best seller. With access to over 5 million titles of eBooks and audiobooks on your tablet or smartphone, it’s quite portable and amazing for users who love reading eBooks. The majority of titles sold on the Kobo Bookstore are in epub format, albeit with DRM. For sharing the eBooks through various eBook apps and devices easier, you should find the best DRM remover to remove DRM. And the solutions to convert kobo eBooks to epub with DRM free will be recommended in this post. The easiest way to convert Kobo to epub Calibre is to use the professional third-party converters. And Leawo Prof. DRM would be the most popular and powerful converter for removing DRM and converting Kobo to epub. As a matter of fact, Leawo Prof. DRM is designed to remove DRM from digital books and then convert to DRM-free files like epub, mobi, azw3, txt, etc. It can convert Kobo acsm to epub so that you can read it on Calibre, and even help you read Kobo eBooks on Kindle. Moreover, it can preserve 100% quality of the original after removing the DRM. With 50X faster processing speed, your DRM-protected eBook will be converted in seconds when you are applying the program. The easy-to-use design also makes it simpler than most of other converters to convert kobo eBooks to epub, and here comes the way. If you are Kobo app user, you can follow the guide below to remove DRM and convert kobo eBooks to epub. Make sure you have downloaded the Prof. DRM on your computer, if not, click below button. Launch your Kobo Desktop app on your PC and login into your Kobo account to enter the main page. 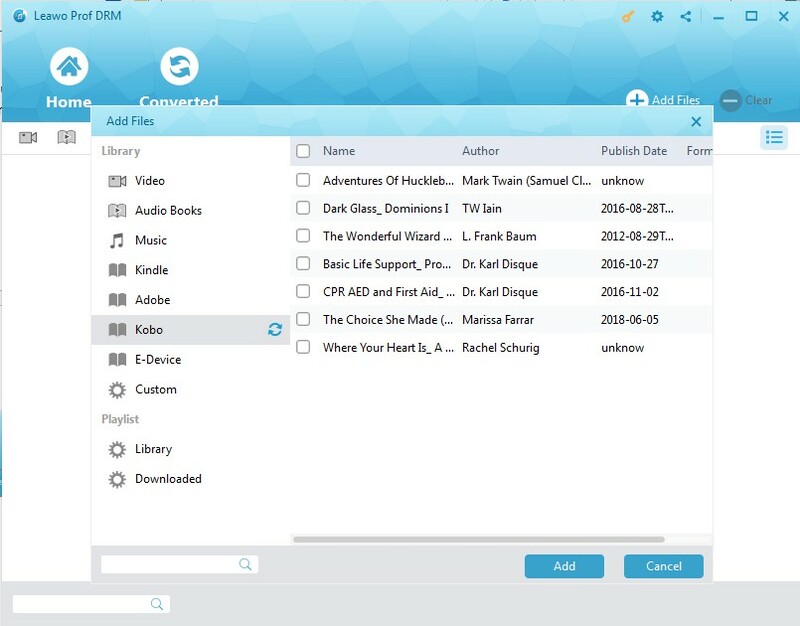 Make sure that the target eBooks from Kobo you are intended to remove DRM must have been downloaded, and you can enter into the “Downloaded” interface to check it out. Run the program to enter the main interface. 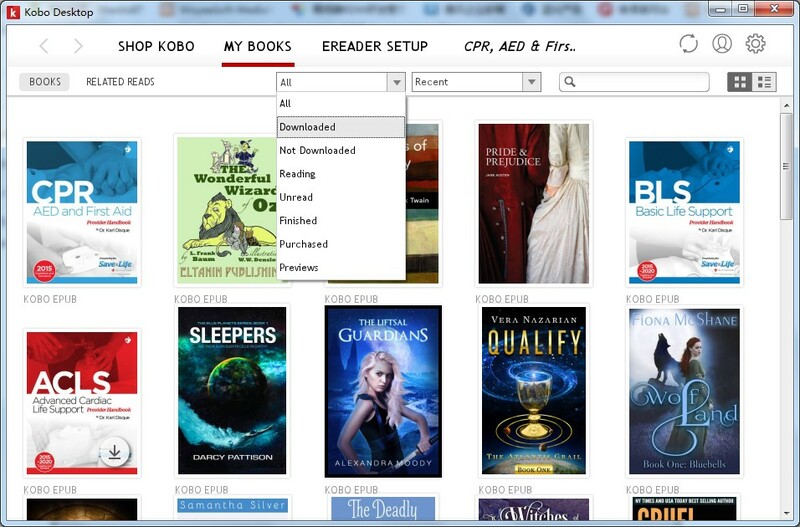 And then you can click Add Files on the sub-menu bar or in the middle interface to import Kobo files. Or you can directly drag and drop the target Kobo file into the middle frame of the program. When the add file panel pops up, click the refresh icon on Kobo button. And then all the downloaded eBooks on your Kobo library will be listed on the right of the panel. You can select the books you would like to convert and click Add for importing. Now choose an imported eBook file and click the edit icon to select epub as the output format from Target Format options. Then you can apply this output format to all eBook file or just apply the setting to current book only. At the bottom of the interface, click the output button to choose an output directory you prefer to save the DRM-free output eBooks. Click the blue Convert button at the bottom to start removing DRM from Kobo eBooks. After a while, you will get the DRM-free epub files with its original quality retained. If you are using Kobo devices to read eBooks, you can use Prof. DRM to remove DRM protection as well when you are willing to get DRM-free epub files. First of all, you should make sure that you have connected your Kobo device to your computer with USB cable. And then the following steps will guide you to make it simply. 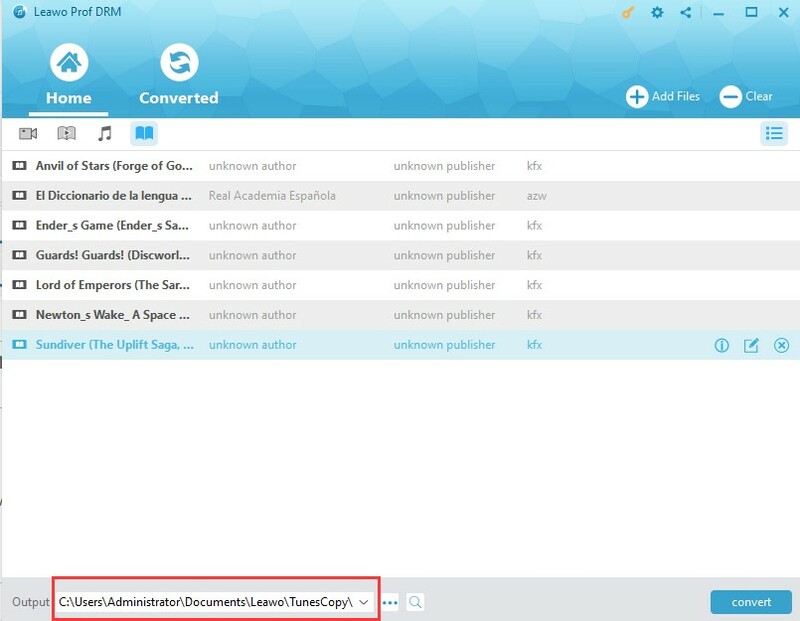 Launching Prof. DRM to enter the program, click Add Files button to pop up the importing panel where lists the Library and Playlist. Then choose E-devices under Library option and click the refresh button to show the book list. Find the books you want to remove DRM, then select them and click Add for importing. Go to the bottom, click output button to choose a proper directory to contain the output files. Click the blue Convert button at the bottom to start changing the DRM-protected book files to DRM-free epub files. And you will make it in a while with high efficiency. Now you can open your Calibre and read the DRM free epub files freely. Obviously, with effective and efficient third-party program, you can easily convert kobo to epub Calibre, no matter you downloaded the eBooks on your Kobo app or your Kobo devices. Except for removing DRM with the powerful Prof. DRM, you can also convert Kobo to epub with free eBook converters. You know that Kobo offers a lot of eBooks and is popular for those who love reading. And it is necessary for you to be familiar with the solutions to how to extract epub files from Kobo in order to share Kobo books on other devices. 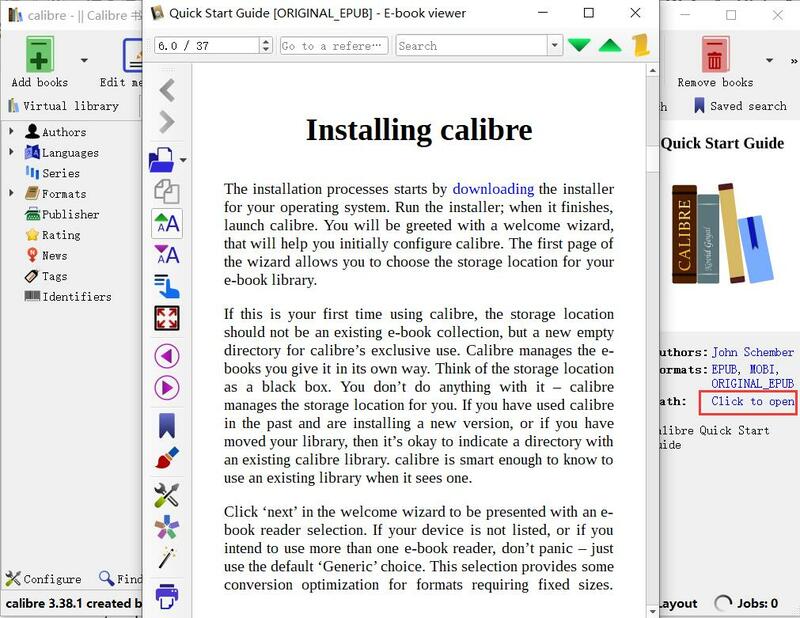 Calibre is not only a free eBooks reader but also an open source eBook converter that can convert Kobo eBooks to epub. 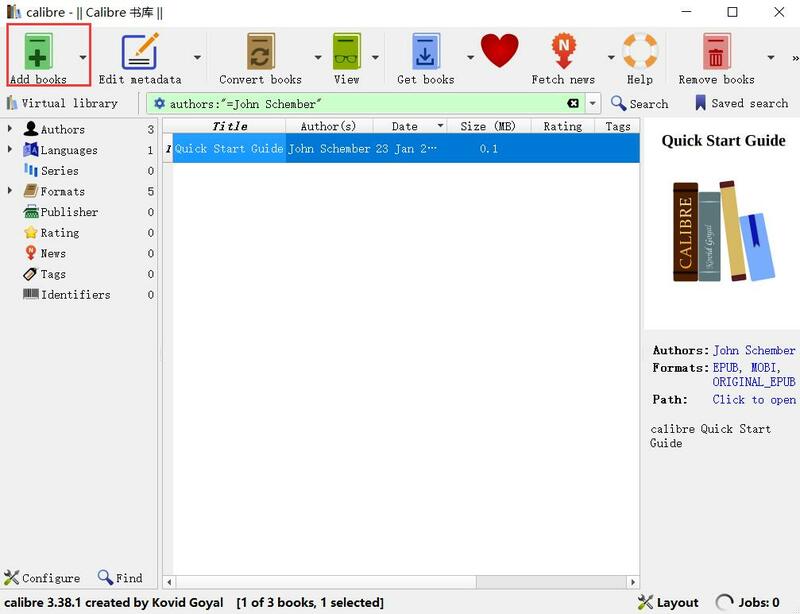 Calibre is a powerful program available for managing your e-book library, and can handle most major e-readers. It is also one of the most popular and commonly used free eBook converters. However, Kobo books you downloaded are in acsm files which is DRM protected and cannot be recognized by Calibre directly unless you install the DeDRM plugin for Calibre. The DeDRM plugin can remove DRM from Kindle books, Barnes & Noble ePub eBooks, any eBooks using Adobe Digital Editions DRM, and the older Mobipocket and eReader eBooks. And then Calibre can convert eBooks to epub, mobi, azw3, PDF and so on. 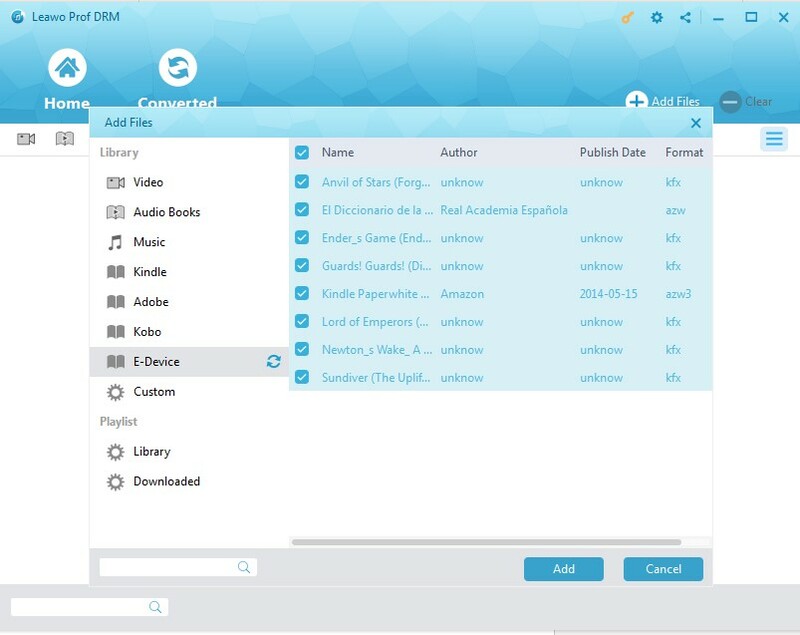 To convert Kobo to epub, you could follow the steps to install DeDRM first. Step 1. 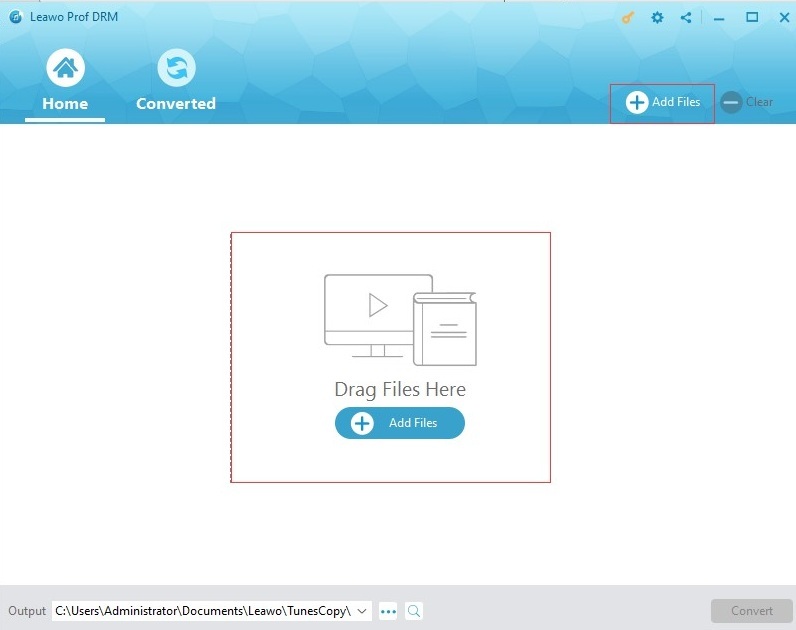 Download the latest DeDRM and unzip it. And then you can run Calibre and go to the Preferences menu to select “Change Calibre behavior”. Step 2: Click on Load plugin from file button at the bottom of the pop-up panel. And then you navigate to the tools folder unzipped and open the “DeDRM_calibre_plugin” folder. And then select the DeDRM_plugin.zip file in that folder to add DeDRM to Calibre. 1. Launch Calibre. Click Add books to navigate to the file you want to add to your Kobo. Click Open for importing into this program. 2. Right-click the name of the imported book from the list on Calibre. And then click on Convert Books button and choose EPUB as the output format. Here you can edit the metadata of the eBook including Title, Authors, Publisher, Tags and more. 3. Click OK to convert Kobo to epub. The epub output file will be listed on the right sidebar of Calibre, and then you can Click to open the file for reading on Calibre as you like. Now you have got two useful solutions for converting kobo to epub, one for some cost and the other one is free. Which one is better, then? Here comes the comparison between them. You can choose any one of it after knowing the detailed differences. Win 7/8/8.1/10, Mac version is also available. Supported after downloading and installing DeDRM plugin. Remove DRM protection from iTunes music files/ video/audio /audiobook/Spotify Music, etc. Epub, mobi, azw3, text, pdf, docx, html, etc. A little complicated for DRM removal. All in all, the two solutions both have their own merits. To convert kobo eBooks to epub, you can choose any one of them depending on your real situation.